Have You Created your Bing Business Portal? Claim and enhance your business listing on Bing. Its free! Last week I wrote a blog post about Google Places (click here) and did not give it much thought until I was sitting with a client and Googled my name. The first listing was my Google Profile complete with my picture and links to my different websites and blogs. So why Bing Business Portal? More customers are searching Bing to find businesses and services in their local area. Claiming your business listing can help increase your visibility and influence customers to visit your business. Get Found – Verify your business listing to ensure prospective customers can find, contact and visit your business. – Add photos, logos, contact information, payment types, menus, and other business details that help your business stand out. Get Customers – Create deals to entice customers to visit your business. Your deals will appear in Bing search results on both mobile devices and PCs. You can even publish deals to Facebook! The Bing Business Portal, replacing the Bing Local Listing Center, provides a set of easy to use listing tools for you to “claim,” verify, and manage your local business listing on Bing.Q: What is a local listing? A local listing is a page showing business details. 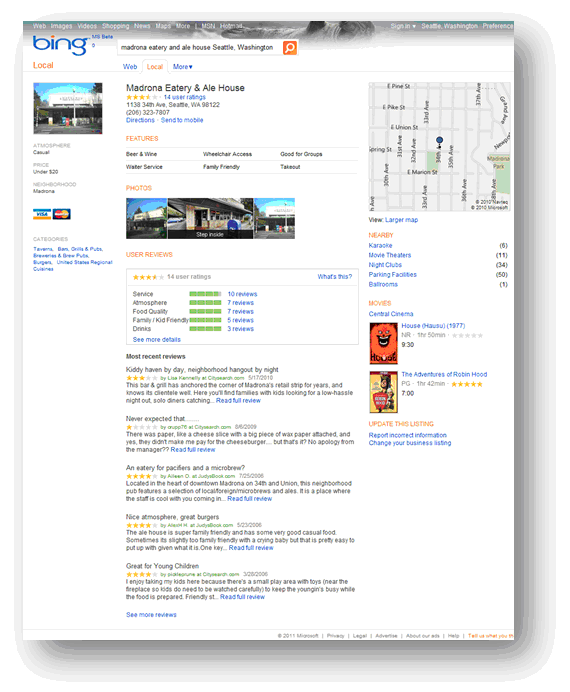 Local listings can be found on the Local tab of the Bing Search results from a computer browser, or at http://m.bing.com on a mobile phone. Q: Who is the Bing Business Portal for? Any business can claim, customize, and manage their listing via the Bing Business Portal. Currently Bing Business Portal is optimized for independent, locally owned businesses where the local business owner or store manager is responsible for making local advertising and marketing decisions. Examples include restaurants, bars, spas, florists, and the like. Q: Does it cost anything to use Bing Business Portal? There is currently no charge to use the Bing Business Portal. In fact, you can create custom deals for free too! Q: How long does it take for my business information to appear on Bing? Our intent is to complete new business verifications and updates as quickly as possible. Initially, publishing of changes to an existing listing will be completed within 72 hours but many customers will see response times closer to 48 hours after your business ownership is verified. Publishing a new listing will take longer but will generally occur within 7-10 days after your business ownership is verified. Previous Post What Are Your Customers Doing Differently Today Compared to Last Year?